If you were planning to upgrade to AMD's next-generation Navi graphics cards when they were released around an alleged end-of-Summer timeframe, then you may have a little longer to wait. A new rumor has surfaced that the Navi line of GPUs won't be released until October, rather than the July-ish date that was originally expected. 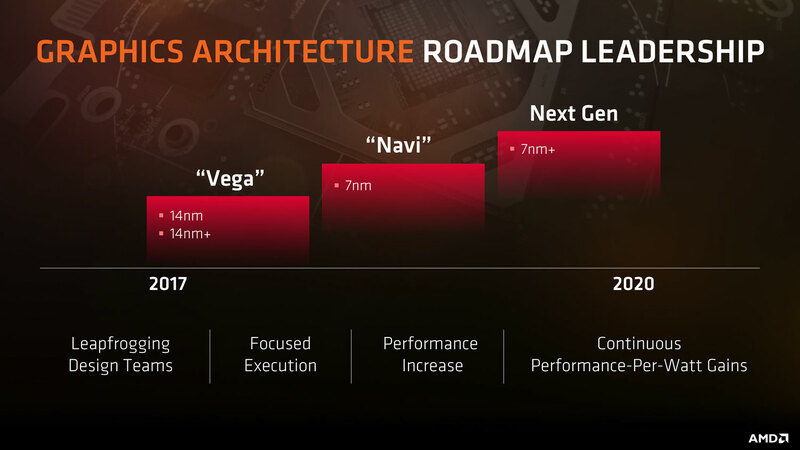 Navi is AMD's next-generation architecture that is expected to be the last iteration of its Graphics Core Next underlying process. Like the Vega 20 Radeon VII it too will be based on a 7nm process but will utilize a differing architecture than Vega to enhance performance and bring power requirements down. The first Navi GPUs are expected to be powerful mid-range offerings, with early rumors suggesting that they could offer RTX 2070-like performance but at a price of just $250. But now that may come far later than expected. WCCFTech has colected a few rumors which point to a delayed release date. Reportedly, this is due to supply issues of the 7nm silicon AMD is using in the manufacturing process. The Radeon VII is also a 7nm part and is in short supply, having sold out almost globally. There are also reports of AMD needing to allocate more 7nm components to next-generation consoles, which are expected to begin their release roll out in 2020. In the meantime we will likely see continued price reductions of existing high-end AMD GPUs like the Vega 56 and 64. It will very much depend on the success of Nvidia's rumored 1660 Ti whether we see similar price drops of RX 580 and 590 cards, which still prove to be the best mid-range solutions available today.